We don’t usually recommend going on holiday and hanging out under bridges, but you’ll have to trust us just this once. 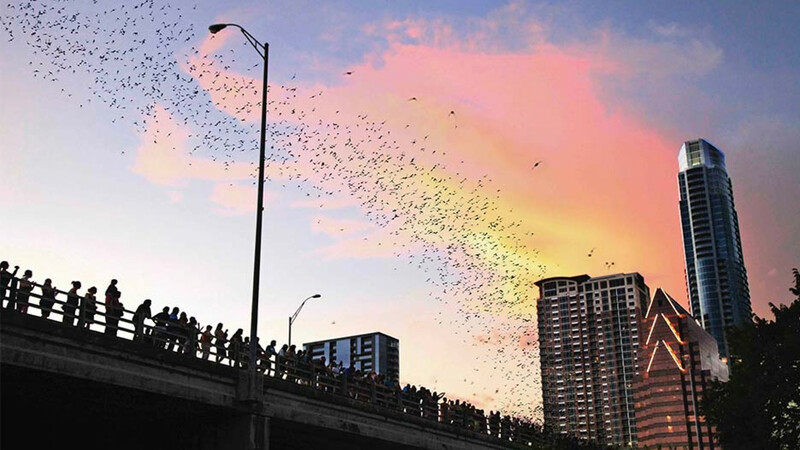 Between March and October, the Congress Avenue Bridge in Austin, Texas is home to the USA’s largest urban bat population, with nearly 1.5m Mexican free-tailed bats paying a visit. Grab a spot on the (crowded) sidewalk on the bridge at sunset and you’ll see hundreds of thousands of bats swarming over Lady Bird Lake. For an even better view, hire a kayak or stand up paddleboard and watch them from the water. How: Live Love Paddle offers kayak bat tours from $45pp. livelovepaddle.com; visit myamericaholiday.co.uk for booking options. Owl fanatics – and there’s plenty out there – clear your diaries for this trip. David Lindo, also known as the Urban Birder (now that’s a job title) has started running bird-watching tours to the ‘world owl capital’, aka Kikinda in Serbia. Never heard of it? Well, the town square is now an official nature reserve for over 750 long-eared owls. That’s not all: elsewhere in the town you’ll spot little owls, Syrian woodpeckers and great grey shrikes (these are all birds, FYI). Spy them while sipping some fine Serbian beer. Buzz, buzz, buzz goes the honeybee – even more so in Oslo, where they’ve just started building a bee highway for the endangered pollinating bee. When we say ‘build’ – it’s more of an urban garden of flower pots scattered across the city’s rooftops; a place for bees to kick back in a hive with an array of pollinating plants to feast on nearby. It’s all due to the hard work of Bybi, an environmental group supporting urban bee populations. When you’ve had your fill of stripey insects, check out Grünerløkka, the Norwegian capital’s answer to Hackney. 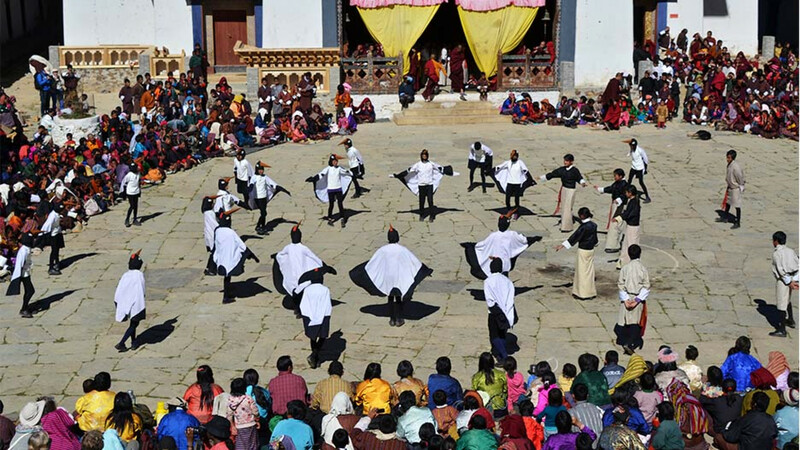 Every November, hundreds of endangered black-necked cranes flock to Bhutan’s Phobjikha Valley for the winter, and their arrival is celebrated with a festival held in the courtyard of the Gangtey Monastery. There’s singing, dancing and dressing up as cranes – all in the name of highlighting efforts to conserve these rare birds. The 17th-century Buddhist monastery – which is located in a striking glacial valley in central Bhutan – is a spectacle in its own right and, unlike the cranes, is there all year round and the starting point for some epic trekking. With only 500 individuals left, the Mediterranean monk seal is one of the most endangered marine animals in the world. The majority of the remaining slippery creatures are lapping it up on the shores of northern Kefalonia in Greece. Duck into the caves here (only accessible by water) and you may spot the wonky-necked animal basking in the sea. Elsewhere on the island, catch sightings of wild ponies in the black pine forests of Mount Athos. If you’re looking to catch the eye of the tiger (not sorry, not even one bit) then take a trip through Central India’s national parks: Kanha and Bandhavgarh. The grassy plateaux lend themselves to spotting tigers, monkeys, mongoose and leopards. The World Wildlife Foundation say the world has lost 97% of its tiger population in just over a century, but India’s 2014 tiger census has reported an increase of 30% in three years – the country is now home to 2,226 tigers, making up 70% of the world’s population. Far from the cuddly cats making their millions on YouTube, Scotland’s wildcat is far more elusive. Wildcat Haven, a fieldwork-based conservation project, is championing the plight of the lynx-esque feline, trying to create a safe, disease-free home in the West Highlands of Scotland. The cats are so endangered (with only around 35 left) that sightings are rare, so if you do want to catch a glimpse you’ll need to book a trip with highland expert Adrian Davis, an ecologist and Scottish international mountain runner who knows every last ditch of the moors. These tours don’t involve running, thankfully. If cocktails, beaches and sunshine sound like more of a holiday than a day trudging through the Scottish moors, then zip across the Atlantic to the celeb-packed shores of the Bahamas. 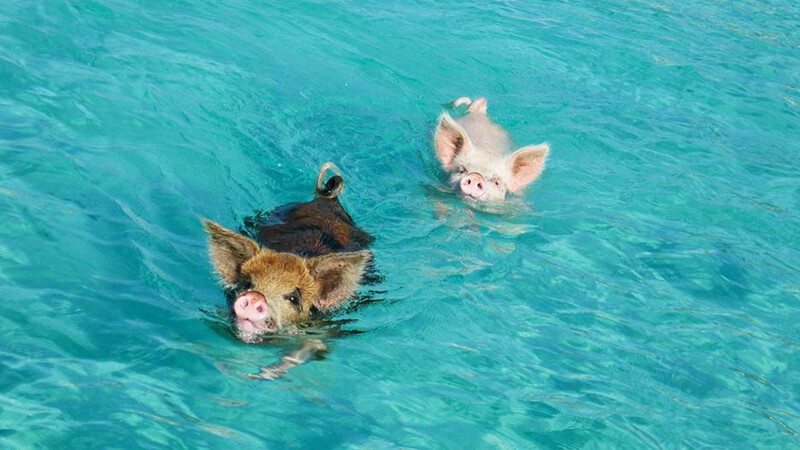 Along with the usual Hollywood suspects, the islands are home to some other beach-bound celebs: swimming pigs. The remarkable front crawlers bask in the sunshine of Pig Island, just off Big Major Cay; no one’s sure how they’ve come to live in such prime real estate, but some stories suggest they are shipwreck survivors who swam to shore when their boat started sinking a couple of hundred years back. Cute AND smart, then. You don’t need to don your thermals and journey all the way to Antarctica to see penguins. African penguins – also known as jackass penguins – have set up a permanent camp on the coast of South Africa, drawn to the pristine white sands and chilly water, no doubt. It’s easy to see them, too – hop on the local train out of the city and stick your head out of the window as it curves along the coast, skimming past epic beach after epic beach (stop off on the way – the stations are right on the sand). Arrive in Simon’s Town and get your camera ready for the best photos of your trip – hundreds of penguins sunbathing and swimming in the South African sunshine. Squid aren’t often celebrated for their beauty – which is understandable, really. But all that changes as soon as you head to the coast of Japan, specifically Toyama Bay, home to the glowing, bioluminescent firefly squid, famous in the region for their light-producing capabilities. These squid normally live 1,200ft under the sea, but the wave motion in this particular bay drags them onto the beach every year between March and June. You need to rise early to see them (we’re talking 3am) but your efforts will be rewarded with sea that glows a deep-neon shade of blue. When they’re not sleeping, sloths tend to go about their business verrrry slowly, which makes them handy to spot in the wild, and even easier to photograph. To see them in their natural habitat, head to the beaches of Costa Rica. Sure, the country may not offer the glorious architectural wonders of some central American countries, but their stretches of sand are hard to beat in wildlife terms, particularly in Cahuita National Park, which is sloth central. There are 615 different species of animal in Costa Rica, so if sloths aren’t your thing, you’ll quickly find something that is. 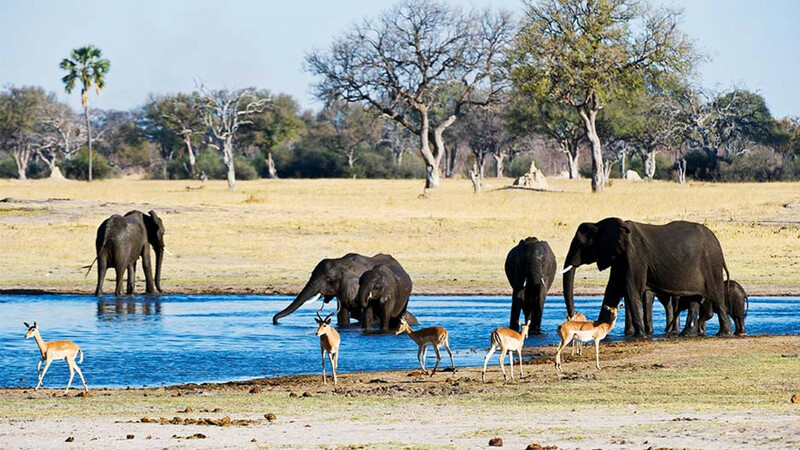 Zimbabwe’s a great option for first-time safari goers, and with Wilderness Safaris you’ll combine glamping with door-step wildlife viewing in the Hwange National Park and Mana Pools National Park. This is a place where elephants and buffalo have right of way, and leopards, cheetahs and lions hang out by the dozens. Stay a night at Victoria Falls and you can cross the river to Zambia for prime rhino spotting. Combine hiking up volcanoes and mountains with gorilla tracking in Uganda. The forested path up the Sabyinyo volcano is steep and muddy (with bamboo ladders) but the summit offers views over three different countries. And then there’s those remarkable primates to look at, too. Escape the big bad city for an afternoon and share the Sado Estuary with a family of bottlenose dolphins. They’re a rare phenomenon in Portugal, and can be viewed all year round if you take a trip on Vertigem Azul’s 75ft catamaran. The team can identify the different dolphins just by looking at the shape of their dorsal fins, and they’ve also named each of the animals. On each trip you’ll be joined by a marine expert crew that includes Be and Jazz – two beagle dogs who can’t resist a day of ocean winds blasting through their fur. A former fisherman and now part tour guide, part marine conservationist, Raja leads whale-watching tours out of Mirissa – a hippy town of bars and beaches on the southwest coast of Sri Lanka. Here, you’ll find some of the best blue and killer whale spotting opportunities in the Indian Ocean. There are plenty of boats offering trips, but Raja genuinely cares about the whales’ welfare, and his considered approach to tracking the mammals means that sightings are pretty much guaranteed – the very least you’ll see is a couple of hundred dolphins. Turtles? Bit tame. Sharks? No flipping way. Strike a happy medium with a day of blue fin tuna swimming off the south coast of Australia. Before you scoff, let us explain. This seemingly mundane fish actually grows to 6ft long, can reach speeds of 50mph and can open its mouth wide enough to fit in an adult human head. Still interested? Well there’s only one place in the world where you can swim with them in the wild – four miles off Port Lincoln, South Australia. The town also claims to be the seafood capital of Australia, so if you’d prefer to see your tuna grilled on the barbie (boo!) you can do that, too. If you have a fondness for furry four-legged animals, you’ll have your fill in Finland. For three nights you could be exploring the wilderness 230km north of the Arctic Circle by husky and snowmobile, although you’ll need a full driving license for that part: you can’t trust any old person on what is essentially a jet ski on snow. You’ll also learn the art of reindeer herding, before embarking on a reindeer-pulled sleigh ride through the forests, Santa style. As part of the trip you’ll also meet 400 huskies (we know, calm yourself) who will guide you through the wilderness on a high-speed journey in search of the magical Northern Lights. 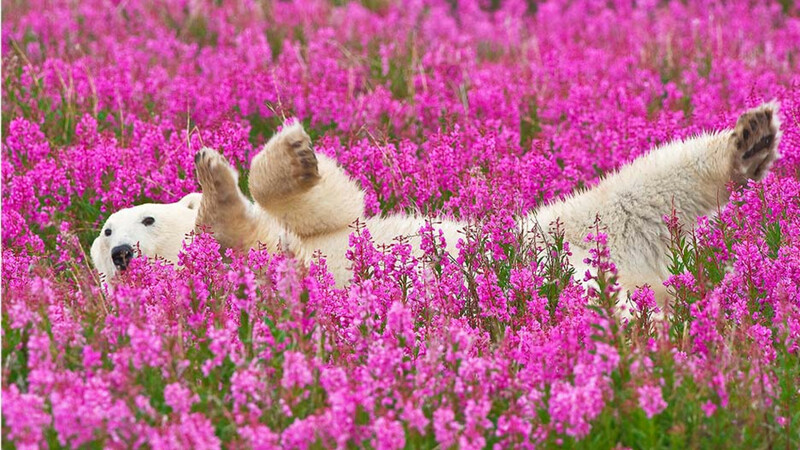 For polar bears and whales in one bank-busting extravaganza, divert all your funds, and attention, to Arctic Canada. 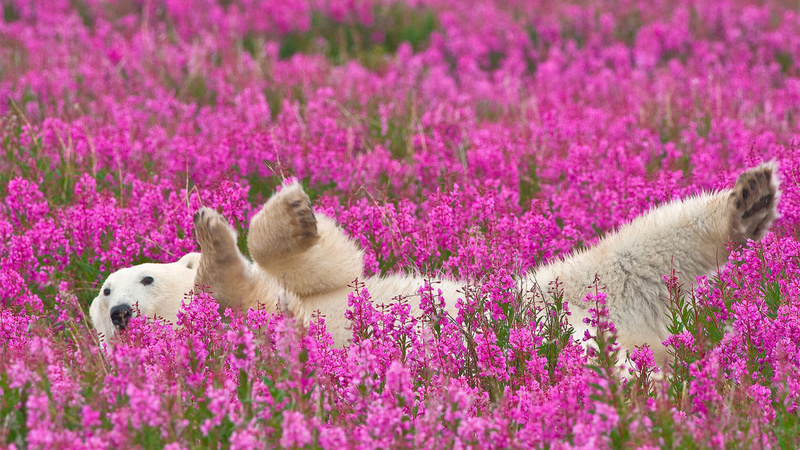 Churchill – the self-proclaimed polar bear capital of the world – awaits at the epicentre of the region, and is home to bear-themed cafés and gift shops (paw-shaped salad tongs, anyone?). But your base will be far more remote. Sitting on the shores of Hudson Bay, the Seal River Heritage Lodge is the stomping ground of 1,000 of the 20,000 polar bears in the world. When you’re not spotting fluffy white mounds lolling around in the ethereal wilderness, you’ll be seeing equally captivating beluga whales – hundreds of them, guaranteed.